The meadowlark is one of the most characteristic birds of the North American grasslands. One of the two species, Western or Eastern (Sturnella magna), may be found in meadows and fields from one coast to the other and from the Canadian prairie to Mexico. The Western Meadowlark prefers drier grasslands and the Eastern chooses more moist situations. Only the Western is found west of the Great Plains. East of the Great Plains, the Eastern predominates although the Western has recently extended its summer range into the Great Lakes region and the Ohio Valley. The meadowlark is one of the most characteristic birds of the North American grasslands. One of the two species, Western or Eastern (Sturnella magna), may be found in meadows and fields from one coast to the other and from the Canadian prairie to Mexico. Meadowlarks are members of the blackbird family. Other blackbird species may have non-black females, but meadowlarks are unique in not having mostly black colors on the male. Just looking at them, the two species are very difficult to tell apart. A key difference is the extent of yellow on the feathers below the eye. In the Western, the yellow feathers extend behind the lower jaw, while in the Eastern the yellow feathers stop on the throat below the lower line of the lower jaw. The songs of the two are very different, however. The Eastern has a simple, clear, slurred whistle while the Western's song is complex, garbled and abrupt. Meadowlarks also make some short buzzy or cackling calls that are very easy to recognize once you learn to listen for them. Males commonly use fence posts as perches while singing. They will sing to stake out a breeding territory which averages 7 acres in size but may vary from 3 to 15 acres. The males will have more than one mate. Up to three females may nest within its territory. Meadowlarks are ground nesters. They weave dried grasses into a bowl shape, typically within a larger grass clump for shelter and camouflage. An average of 5 eggs are laid and they may have two clutches per year. The eggs are white with brown and lavender spots concentrated at the wider end. Incubation takes two weeks and the young are full grown 6 weeks after hatching. The young have some black spots on their breast but do not develop the distinctive black "V" until the fall molt . Nesting and brood-rearing chores are done primarily by the female, although the male may help feed the young.Nests are sometimes subject to brood parasitism by the Brown-headed Cowbird (Molothrus ater). Cowbirds lay their eggs in other birds nests. Both ground-nesting and tree-nesting birds may have the cowbird's unwanted additions in their clutches. Some species of birds will remove the intruding eggs, abandon the nest or just build a new nest on top of the "infected" one. Other species will raise the baby cowbirds as if they were their own. Meadowlarks are ground feeders. The majority of their food during the growing season is insects, spiders and other small invertebrates. Some seeds are eaten also, and that becomes the bulk of their food in the winter. During winter meadowlarks will form into flocks of up to a few hundred individuals which are often seen foraging in fields and pastures.While foraging, a meadowlark walks slowly through the vegetation, occasionally picking and probing with its long pointed bill. When it spots an enemy, it will typically freeze and hunker down while casting a wary eye at the source of concern. In this position, the yellow of the chest is hidden and its brown and white back feathers help it to blend into the surroundings. If the enemy approaches too close, the meadowlark will fly a short distance away and drop abruptly back into the grass to disappear again. 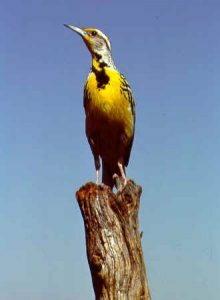 The Western Meadowlark became the state bird of Kansas on January 29, 1925 (Kansas Day) after a vote by over 121,000 school children. The election was coordinated by Madelaine Aaron, who was then the secretary of the Kansas Audubon Society. 43,895 votes were cast for the Western Meadowlark and the second and third place finishers were the Bobwhite and the Cardinal. When you visit the prairie, look and listen for meadowlarks. Depending on where you are, you may find either or both species. As with most wildlife, if you view them carefully from a non-threatening distance, you can observe their behaviors and better appreciate their place in the web of life.